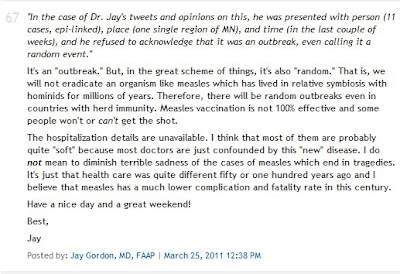 Harpocrates Speaks: "Soft" Hospitalizations in Minnesota Measles Outbreak? In the comments, Jay made several statements that are, well, just plain wrong. For example, he said that we would never be able to eradicate measles. Since measles only exists in humans, if enough individuals are immunized, the virus will not be able to find a susceptible host in which to replicate, and eventually, the last viruses will be wiped out, much like the eradication of smallpox in 1979 or, more recently, the 2010 eradication of rinderpest, a disease that plagued cattle. There was one other thing that Dr. Gordon mentioned that piqued my curiosity. Dr. Gordon suspected that the 6 (at the time of his comment) hospitalizations that had been reported were "soft" hospitalizations. 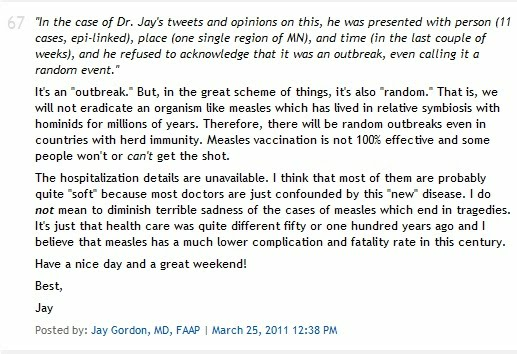 In other words, he thinks that the hospitalizations were not necessary and were merely due to the treating physicians not just being unfamiliar with measles, but being "confounded". While "soft" admissions were certainly a possibility, I had been wondering what the details actually were; how many complications had there been to necessitate hospitalization? So, I decided to go to the source. I wrote to the Minnesota Department of Health, which has been providing regular updates on the outbreak. I received a response from Patricia Freeman on March 30, 2011. According to Freeman, the 8 hospitalizations that had been reported to date were all in children under 5 years of age and were "seriously ill" enough to require hospitalizations. 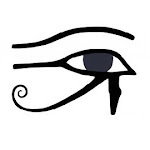 Although she was unable to provide me with the total number of complications that have occurred, she did inform me that "we do know that some of the complications include pneumonia, dehydration, diarrhea, and ear infections." The reported complications are all the type of problems we would expect. The numbers reported so far (8 of 14 confirmed cases, or 57%) may seem like a very high rate of hospitalization, much higher than the 20%-30% expected. This may be due to the fact that there may be more cases of which the MDH is unaware. Cases may go unreported for a number of reasons: symptoms too mild to warrant physician visit, fear of stigma, distrust of health professionals and so on. The numbers may also be higher because, as Liz Ditz articulated, many of these families may lack the resources to adequately care for their children at home. Thankfully, Minnesota, home to the Mayo Clinic, has a very good medical system. As long as those who have become ill with measles get timely medical attention, we will, hopefully, not see any deaths from this outbreak. Although the details are necessarily bare bones at present, Ms. Freeman stated that the MDH will perform a complete review of the outbreak, including the individual cases. For more information, visit the Minnesota Department of Health's Situation Update page. I will also keep the numbers updated on Minnesota Measles Outbreak by the Numbers: A Timeline. Thank you for following this up, Todd. As you know, I also found Dr. Gordon's comments infuriating -- the smug assumption that the children weren't really ill, but their pediatricians didn't know what to do so just put them in the hospital. I'll say it again here: High vaccine uptake is a social justice issue. Dr. Gordon and other primary-care physicians who advocate for vaccine refusal are verging on betraying their Hippocratic oaths. I have to confess that "soft hospitalizations" were one of the different scenarios I was considering as possible hypotheses on why the high hospitalization rate. Unlike a certain physician, I now see the evidence and would like to retract that hypothesis and accept the alternative. One thing that I like about my colleagues at Minnesota is their willingness to share their data whenever possible. We'll see what their outbreak report has to share, and whether or not that evidence will change certain people's minds. Yeah. Ms. Freeman was very considerate to give permission to share the details. I would have posted this information sooner, but I really wanted to wait until I got an official okay to share it. My home state makes me proud.